The two of us have always said that one of these days, a project would come along that we wouldn’t be able to let go. This one was close. We acquired No. 4 back in late 2016. We knew even then that this would be a special project — sometimes, they just feel really right. The devil is in the details, so let’s just get right to it. It’s funny when you get into these properties from the 70’s and 80’s. The kitchen and living spaces are all but obsolete, so we always find that we have to get a little creative here. No. 4’s kitchen was narrow, with cupboard side bowing out to provide more space. We ripped out the upper cabinets to replace with custom built 42″ boxes (the storage!). 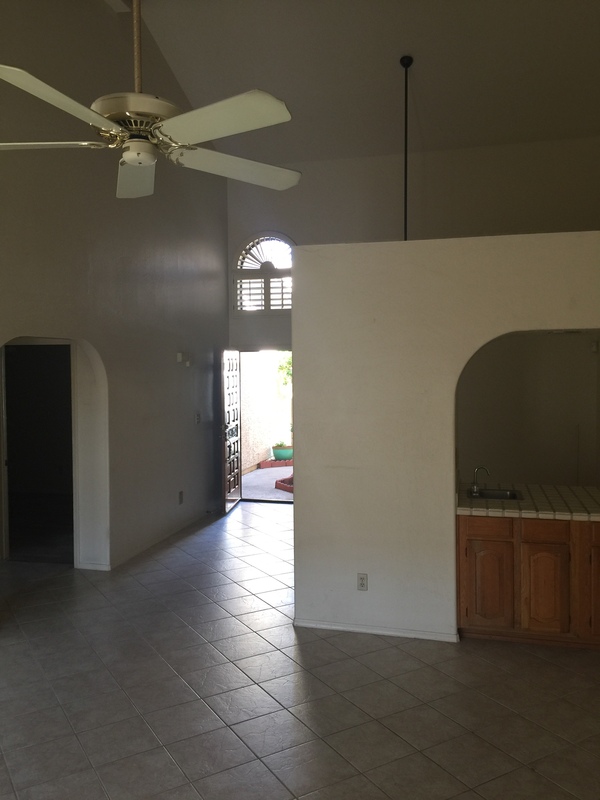 The island was removed, as was the *super chic* ceiling fan in the middle of the room. 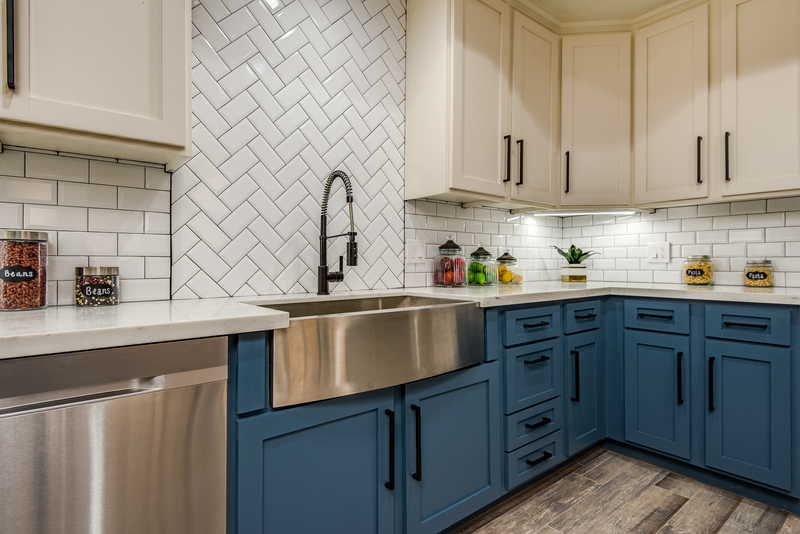 Bright white upper cabinets allowed us to get a little crazy with the bottoms: a velvety blue, for a pop! 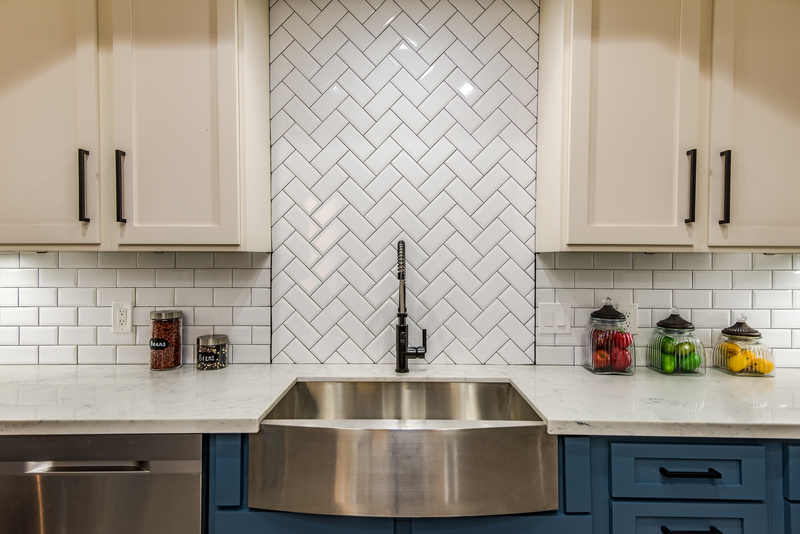 A backsplash of white subway tile with dark grout (ALWAYS with dark grout!! ), in offset and herringbone patterns added interest. 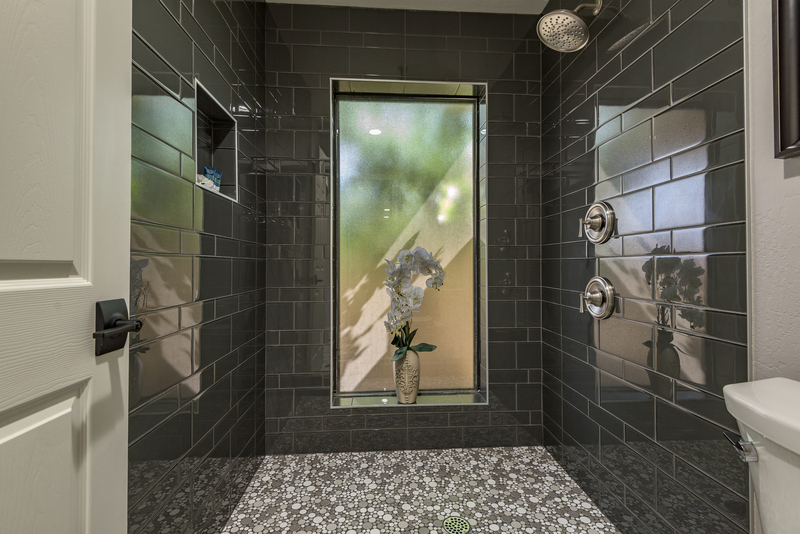 We went with strong matte black hardware for the doors and fixtures. Our special touch? Speckled white barn wood in the recessed ceiling. 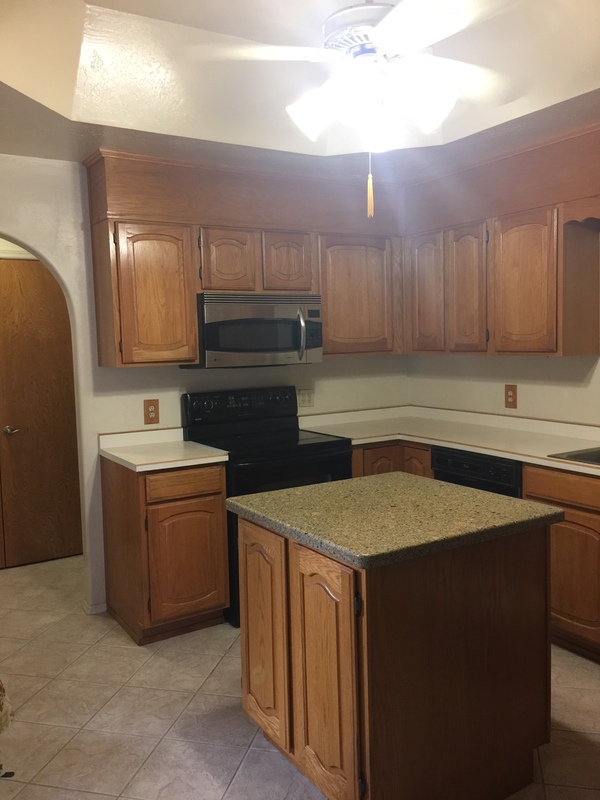 The kicker here was the bright white LED lighting in the ceiling and under the cabinets. 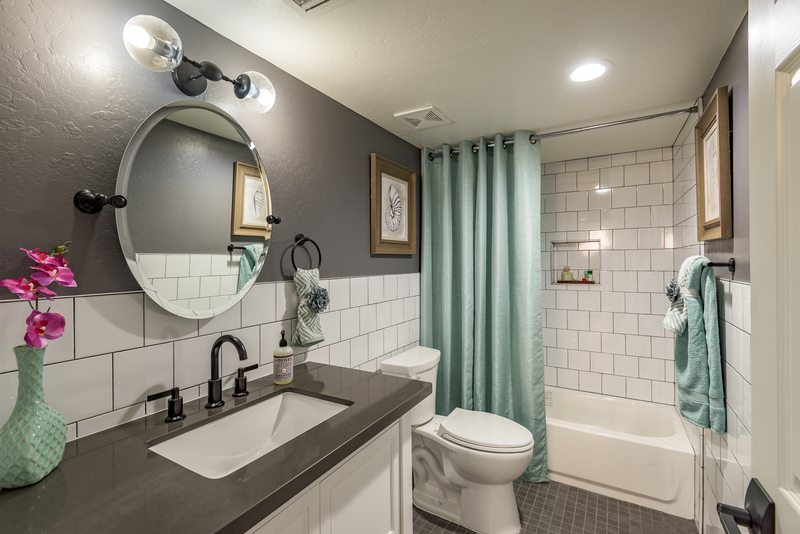 This is so often missed, but having bright “daylight” bulbs really make whites pop, and bring the color out of accent pieces and decor. So important! The living area of No. 4 had so much potential. 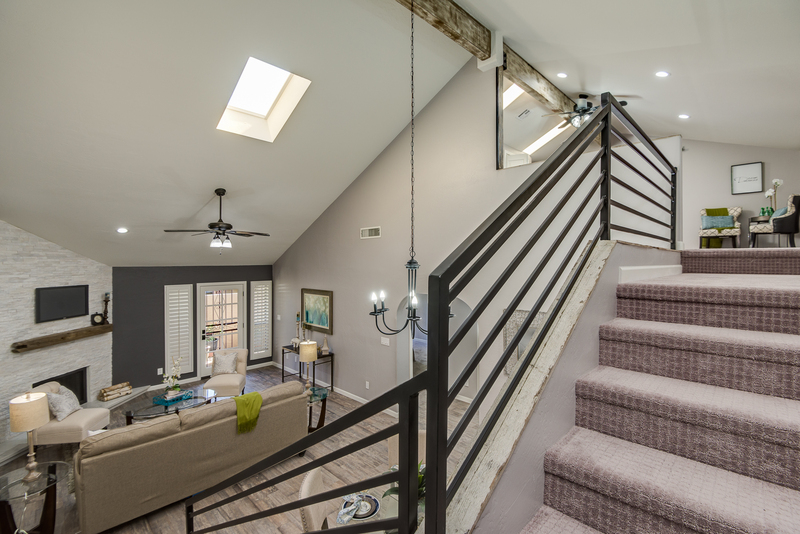 Vaulted ceilings were crested with a wooden beam (swoon) that went straight through the entire home. A skylight brought oodles of natural light through the living space, and windows from the North and South walls certainly didn’t hurt! 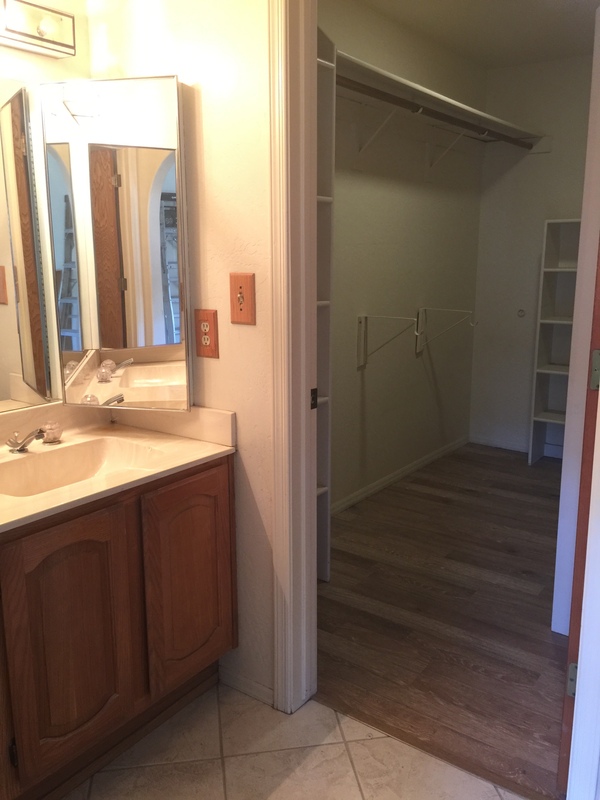 But, the first order of business – you guessed it – was to demo that wet bar-coat closet-catastrophe! From the moment you walk in, the entire main living area was partitioned by that oddly placed structure. 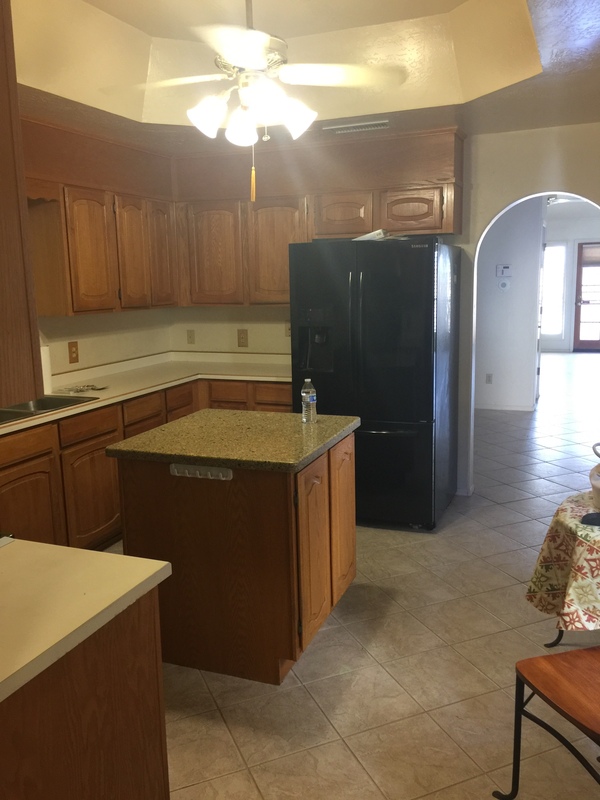 You can see the wet bar area with the cabinet and counter top. From the framed out end was a coat closet. 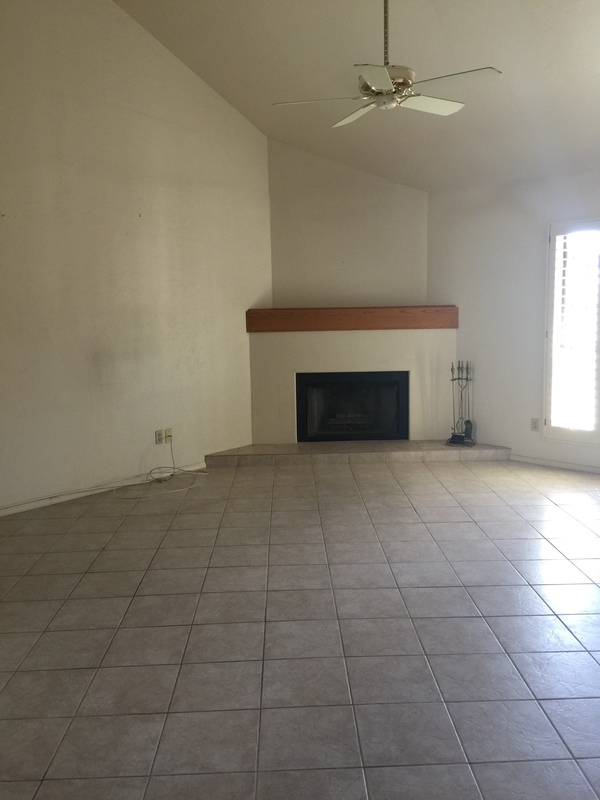 As soon as we demo’d it, the space absolutely came to life as a big, open living area. 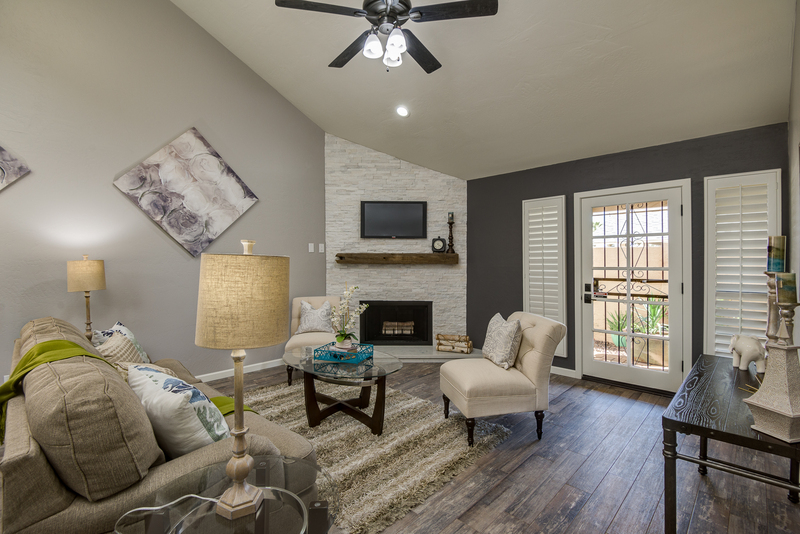 Wood tile flooring was laid, and a soft grey paint palette created the most welcoming space. 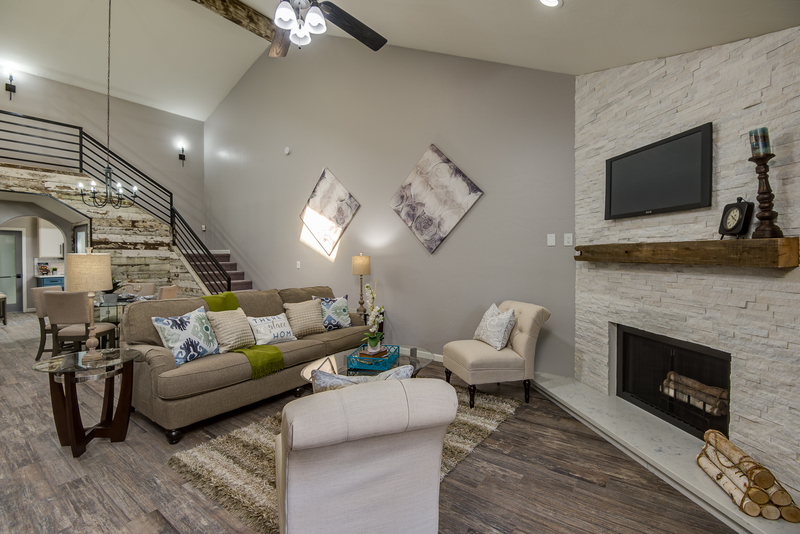 We built out the rest of the fireplace to create a flushed, floor-to-ceiling look, and faced it with our signature white stacked quartz. 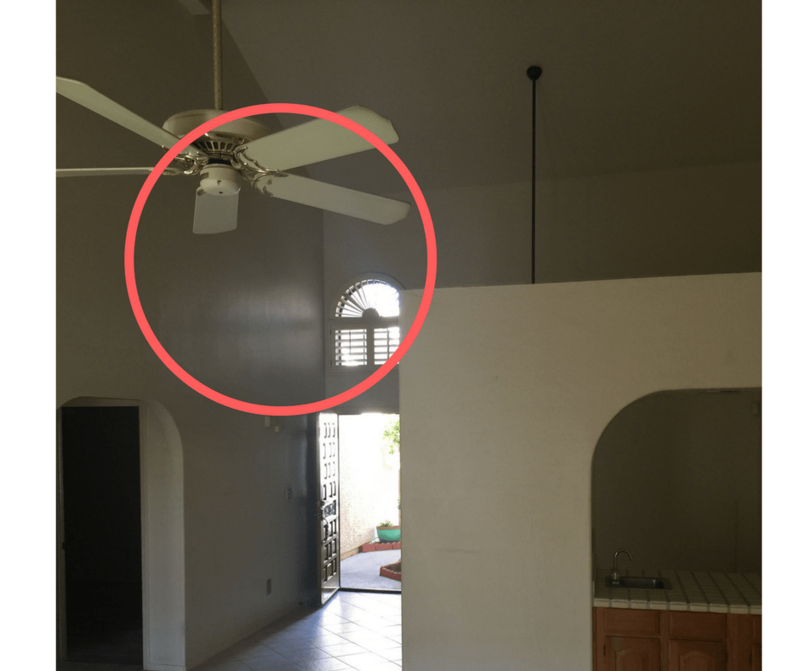 The ceiling beam was refinished to match the wood accent wall of the…oh, you noticed? Yes, the new staircase. To the new lofted room. That’s right — when we acquired No. 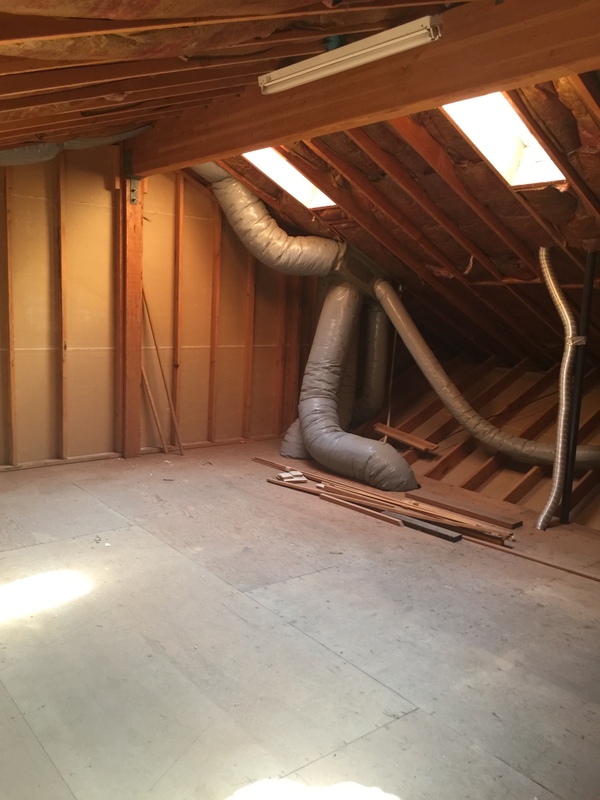 4, we noticed a huge attic space that was COMPLETELY unfinished! The only access was through the garage, up a rickety pull-down ladder. 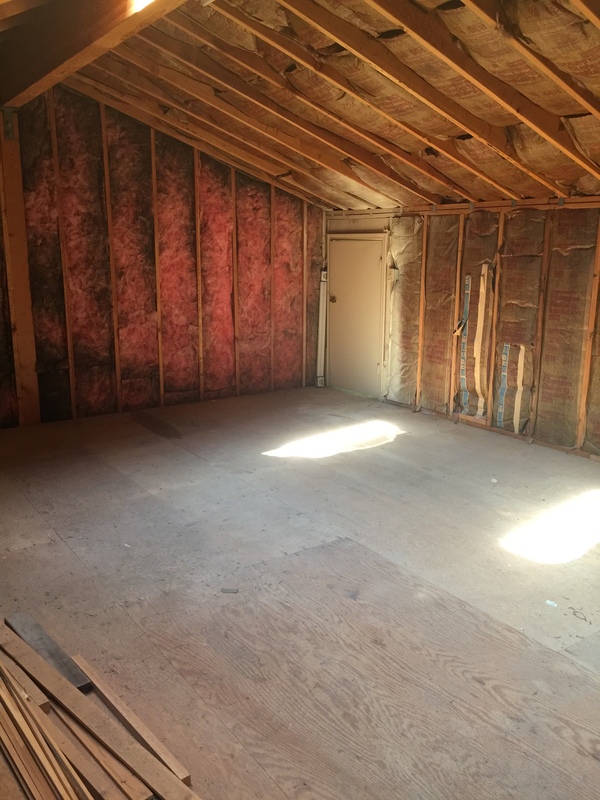 There were more than 300 sqft of space, ripe for the taking. 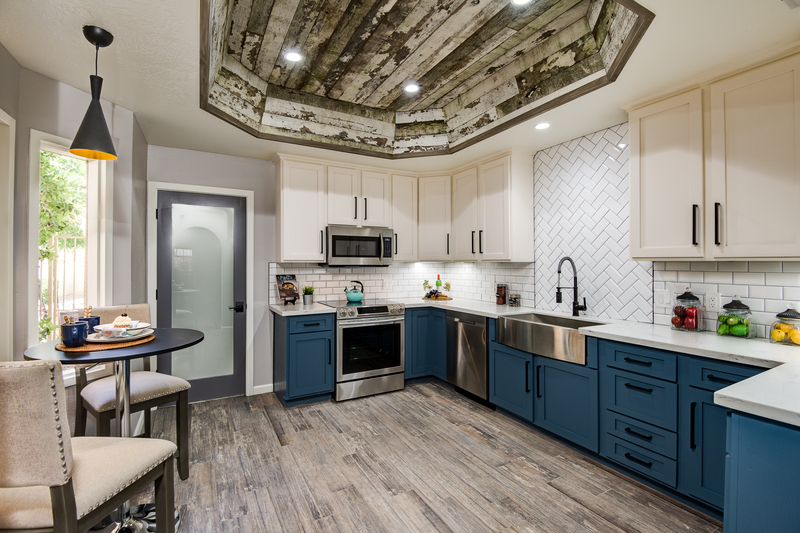 Could you believe that there were two beautiful skylights already built in to the ceiling? 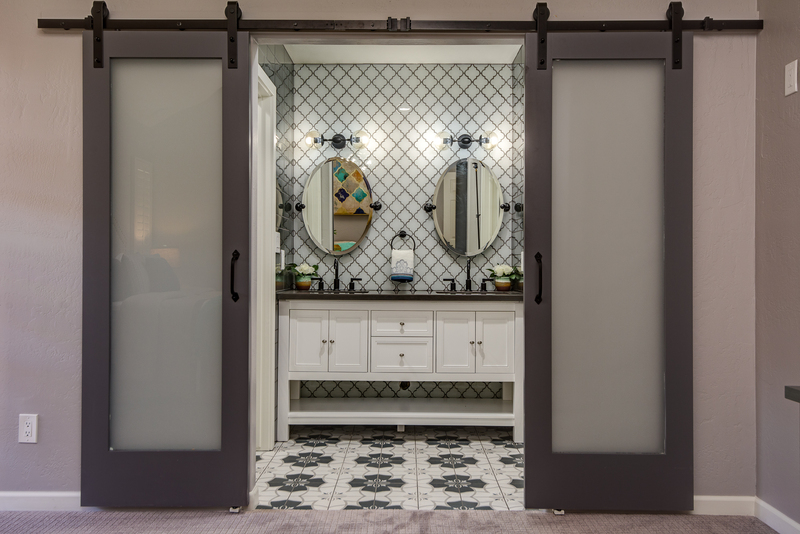 When we stepped into this room, we imagined all kinds of possibilities for such a versatile space. We knew we had to convert it into a lofted bedroom. 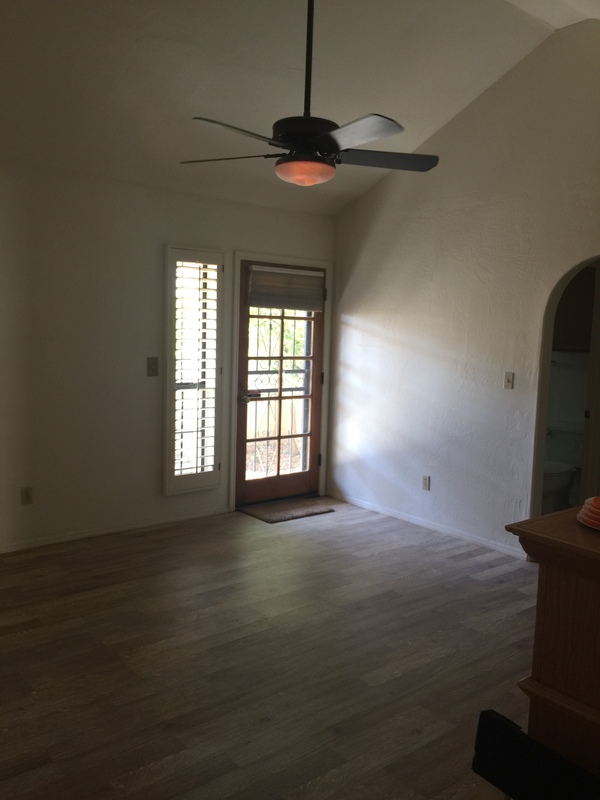 This space took some serious thought, so let’s talk about it. We needed to create access into the loft. 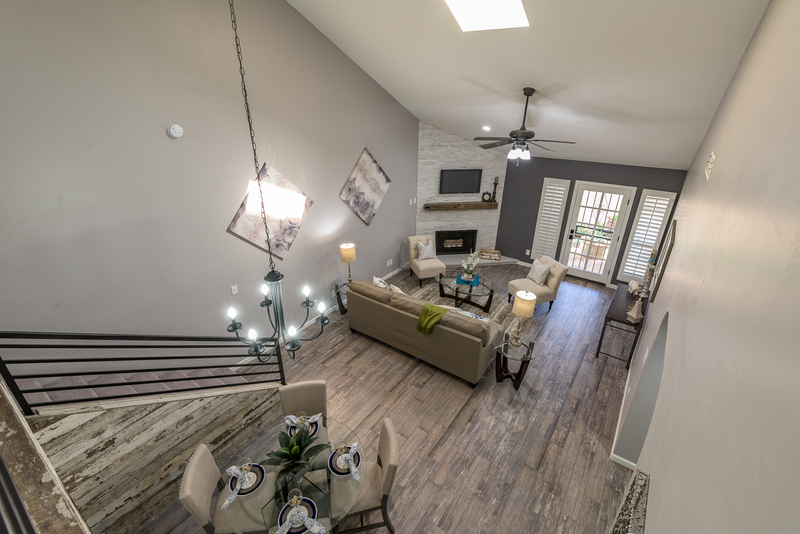 The most functional way to do this was through the wall into the main living area (image above). 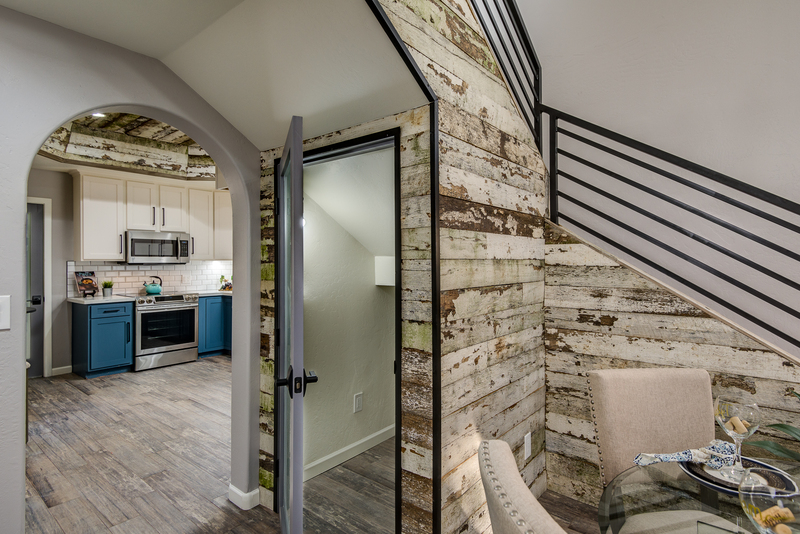 Part of the wall was left open to keep that “loft feel”, and we loved that the support beam flowed all the way through! 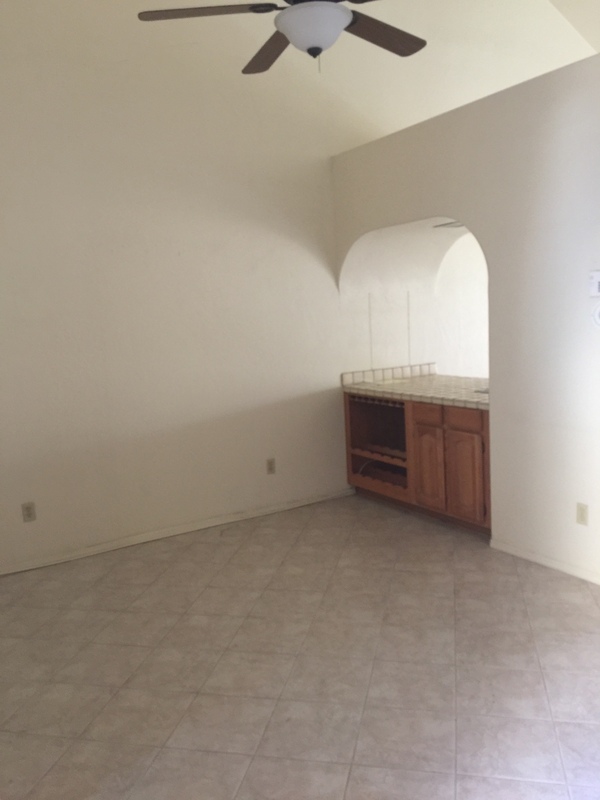 But this could easily be closed off with a door by any new buyer. When you need a staircase to appear out of thin air, you have some freedom on making it as functional as possible. 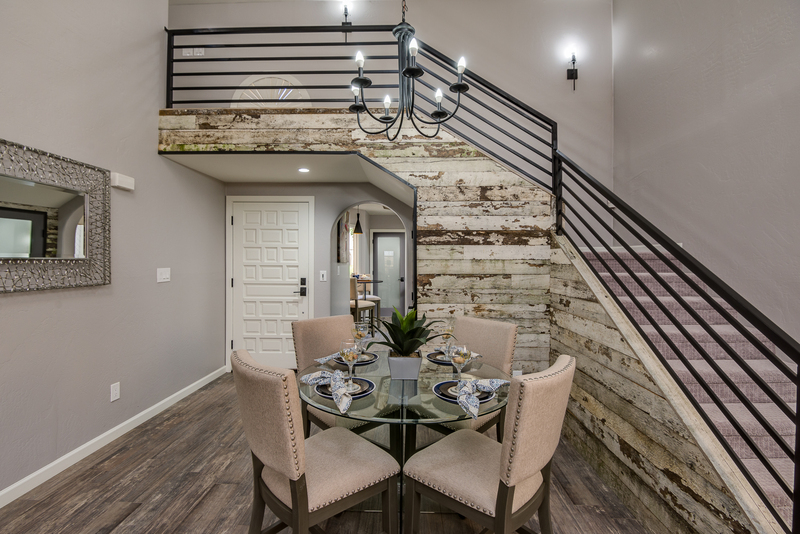 The staircase was designed to wrap around the dining area, and adds a ton of storage underneath. 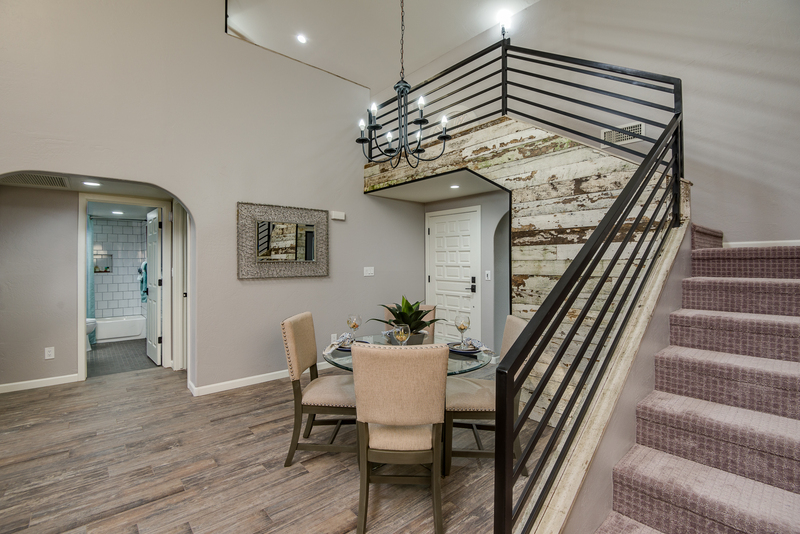 We designed a custom steel railing; the color tied into the hardware we used throughout the house, and we wanted the styling to reflect a clean, industrial look. Then, we faced the staircase with more speckled barn wood, purchased from Porter Barn Wood, that we also used in the kitchen. 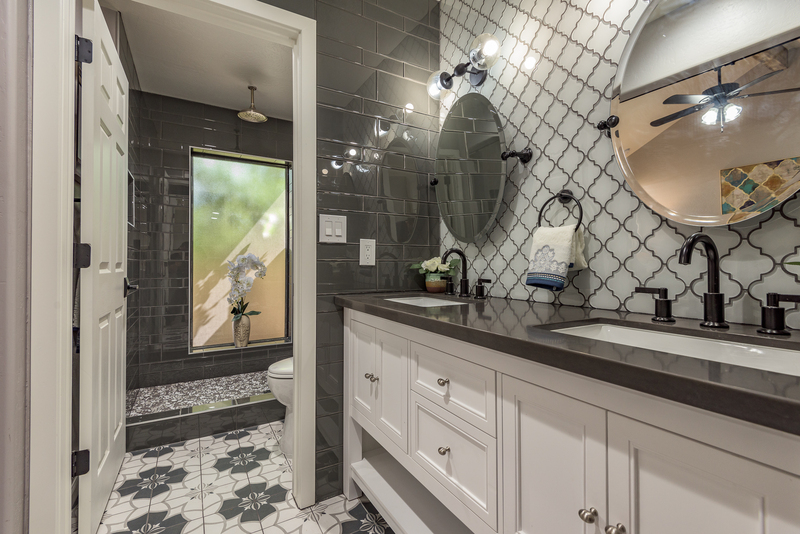 This turned out to be one of our most favorite rooms! 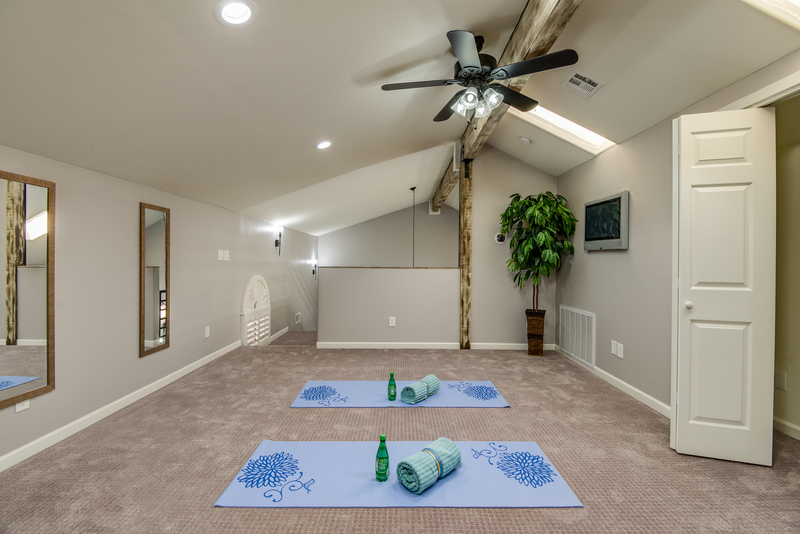 We staged it as a yoga/active room, because between the skylights and new bright canned lighting, the room is bright and welcoming. But, even as a guest bedroom or an office, this room would give us serious envy! 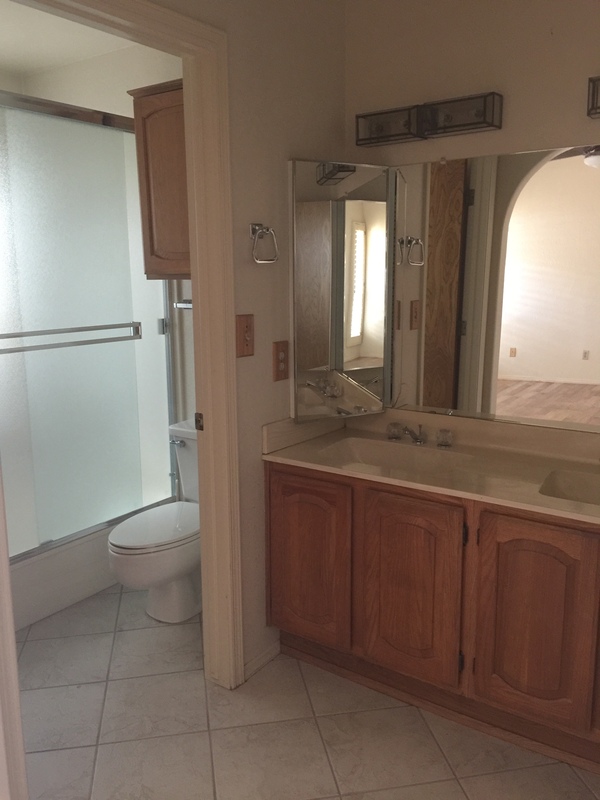 There was enough space here to add a full bath with a shower, in case it were to be repurposed as a second master or rental studio. 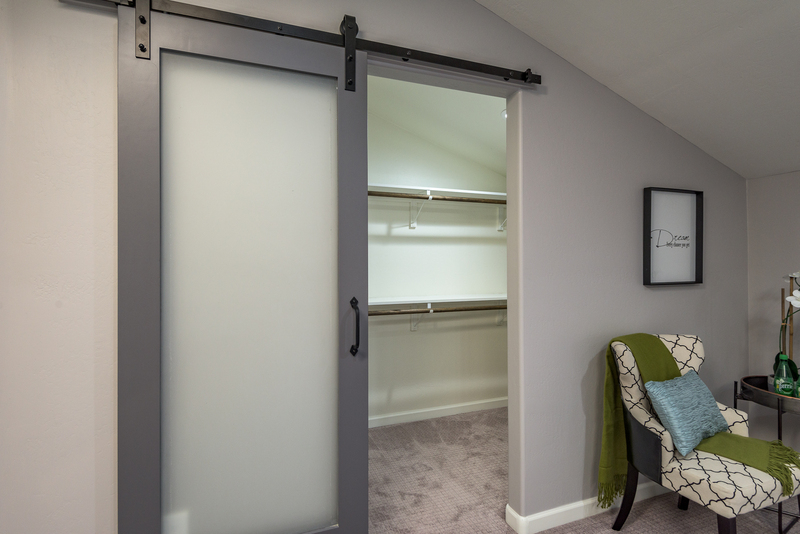 A huge walk in closet also provides more storage! 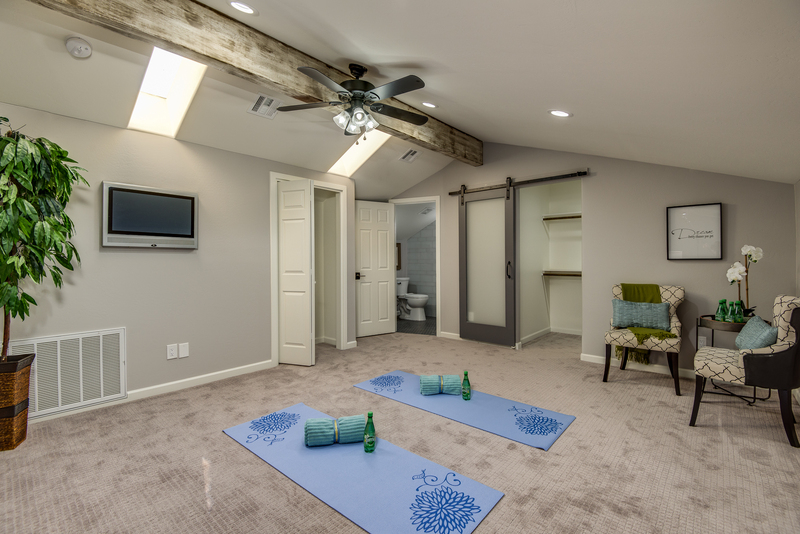 Because of this room, Stefanie’s life will not be complete until she has her own yoga room with gorgeous skylights. We are in love! 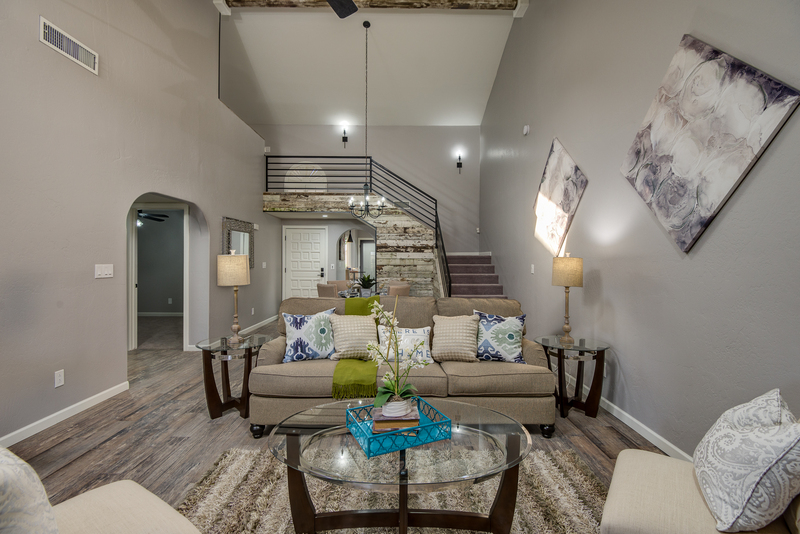 The vaulted ceilings throughout this home just lend so much! 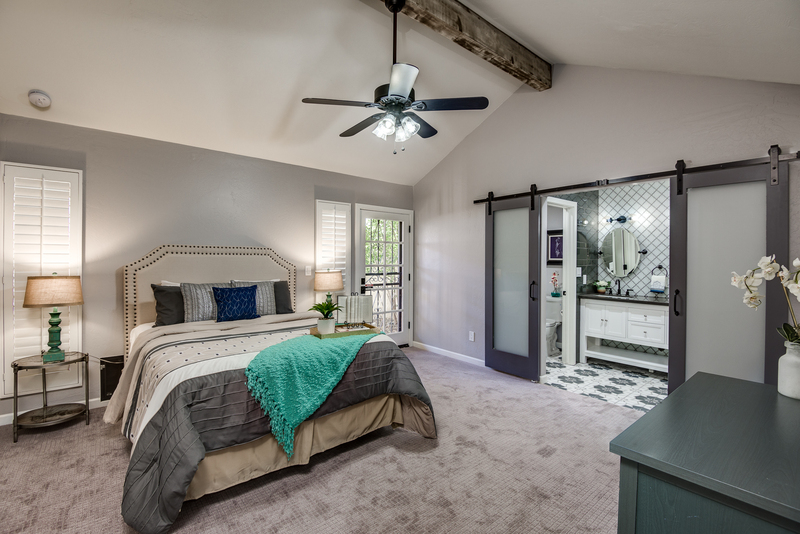 This master suite feels so spacious with the high ceilings, and carrying through the ceiling beam kept the feel of this home consistent. 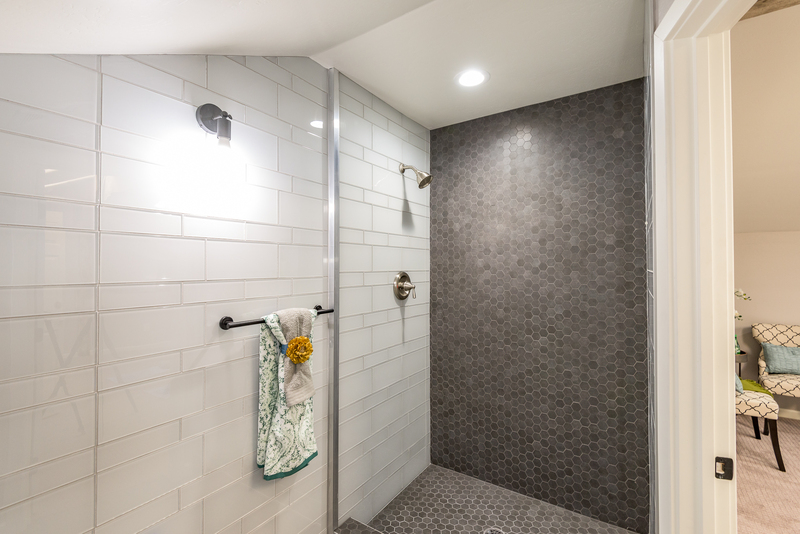 The bathroom got a major overhaul, with floor-to-ceiling tile, new fixtures, a new vanity, and a full shower treatment. 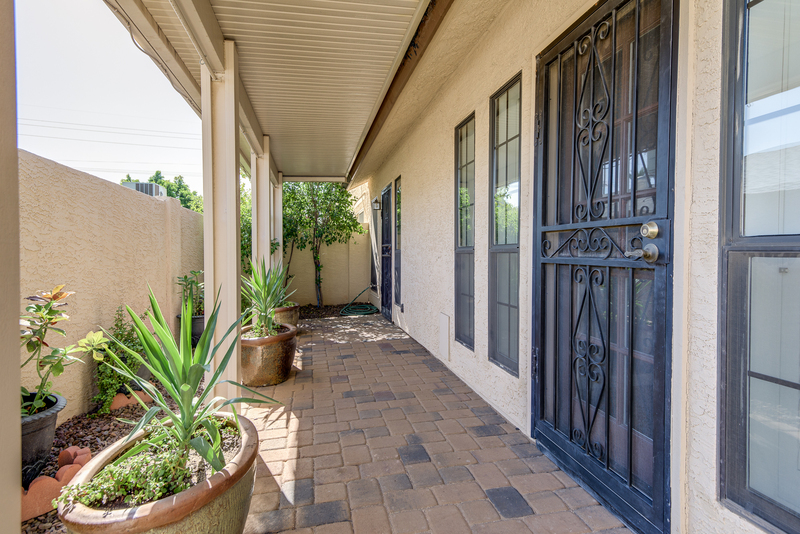 A third bedroom and guest bath finished off the lower floor, and we did a major cleanup of the back patio. Some artificial grass and a pavered patio made for the perfect outdoor space! 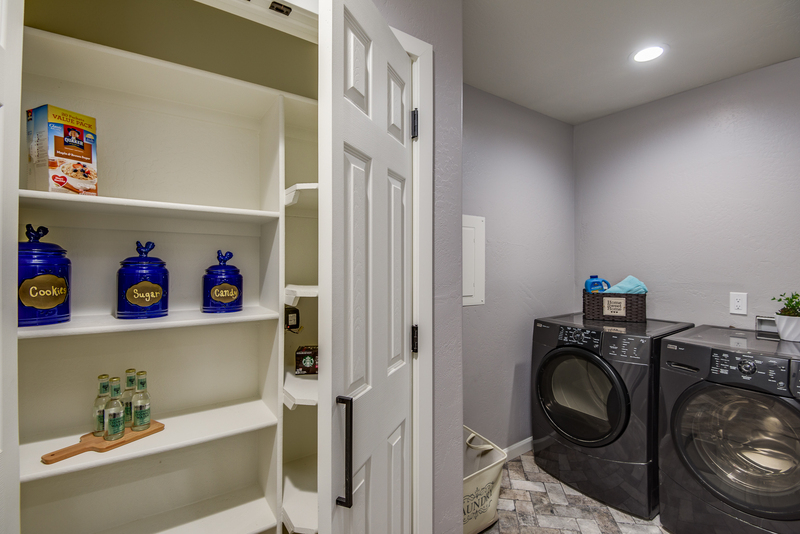 We also loved the inside laundry room. 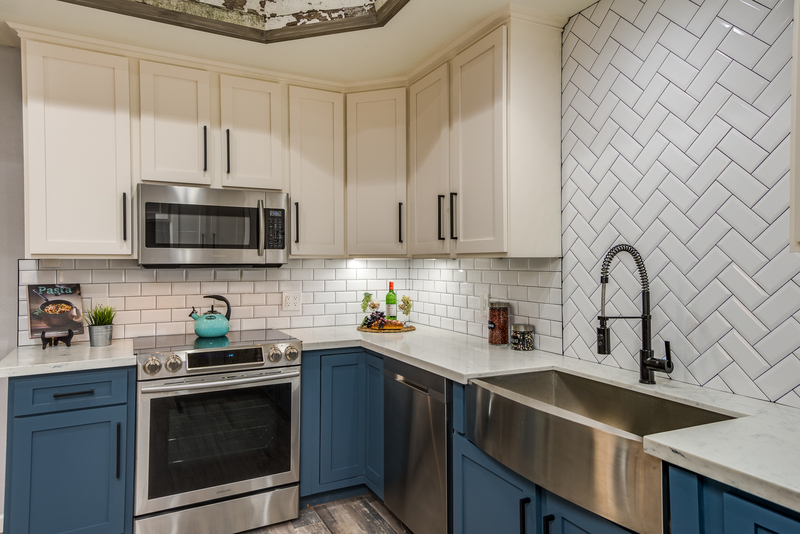 With enough space for a large pantry, and that herringbone brick flooring, it’s the perfect utility room! This home sold on the first weekend to the absolute sweetest people! 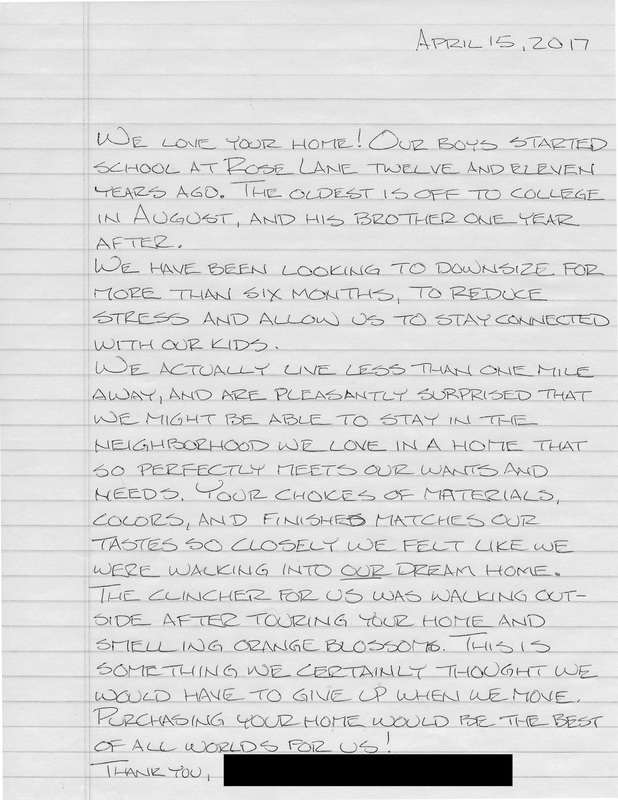 With their offer, they sent us the most amazing hand-written letter to introduce themselves and tell us their favorite parts about the property. Turns out, they lived right around the corner, and were looking for the perfect place for their changing family dynamics! We are so, so honored to have had this little part in their lives, and we hope that they enjoy this special home for years to come! To be the first to know about new projects, or just to say “Hello!”, follow us on Facebook and Instagram!